The annual Walk for Alzheimer's aims to raise awareness and $360,000 to fund programs for people living with the illness. 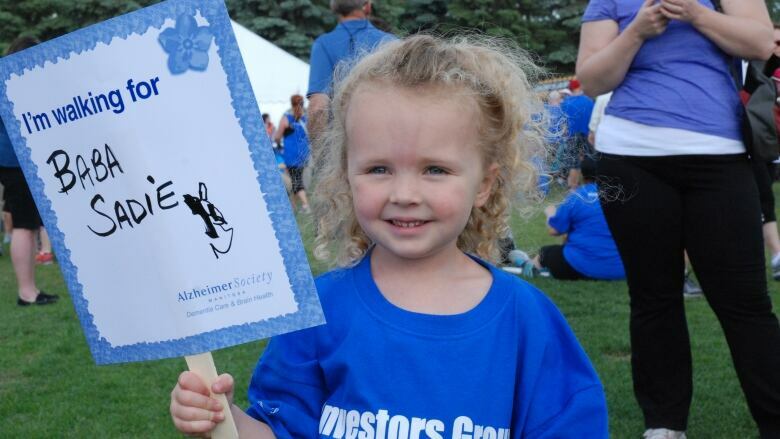 An annual fundraising walk for the Alzheimer Society of Manitoba is taking a personal tone for one of the organizers this year. Society CEO Wendy Schettler said it's a bittersweet occasion, as this time around she's walking in honour of her father, who lives with a form of the disease. The walk falls on his birthday this year. Her father, now 74, has what's known as Lewy Body dementia. It's a combination of the physical deterioration associated with Parkinson's and the cognitive symptoms of Alzheimer's. Hallucinations are a common symptom that Schettler's father experiences. The symptoms started after her father retired, and he now lives in an assisted care home, she said. "He's at the end of his life and in palliative care, so the goal really is comfort; it's really about keeping him comfortable," she said. Schettler is also reflecting on the ups and downs experienced by many people who have loved ones with Alzheimer's. "You can't always choose how you're going to experience things and how you're going to feel one day from the next," she said. By telling her personal story, Schettler hopes to inspire Manitobans with similar experiences to come together as a community. But the walk is also a fundraiser — the goal this year is to raise $360,000 to support awareness and programs such as Minds in Motion, a support group for those with early-stage dementia. "We are primarily funded by the community, and this is our biggest fundraiser of the year," Schettler said. The walk will start at the Festival Stage at The Forks at 6 p.m., with on-site registration starting at 5 p.m. Schettler recommends pre-registration, which can be found here.